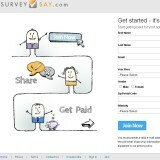 Survey Say found at surveysay.com, is a get paid to take surveys website for a market research business that serves as a middleman for other companies looking for consumer opinions. However, there are more complaints about it than most survey sites I run across. There are fundamental problems with most survey sites, and one is the payout issues and policies. Each one has different ways of paying out, but the difference is what kind of gift cards and or points for tasks you do to earn them and how little you get for your efforts. However, a big problem is that sites like “Survey Say” are designed to collect your personal info and sell it to third parties for profit. Soon after registering you will begin to receive tons of spam from others due to your involvement with them. With Survey Say, there are little tricks they use to keep people from earning their rewards. Things like stopping the surveys almost all the way through and saying you’ve been declined. They terminate your account after you’ve earned enough and say that you violated their terms. Survey Say takes forever to pay out and they find a way to back out of their commitment many times. You will be lucky to make a penny with them on anyone survey that you manage to complete. It is really up to you to figure out if it’s worth it to spend inordinate amounts of time for so little in return, that is if they even let you get through a whole offer after taking it for 15 minutes. Since it is free to join ‘Survey Say’, I can’t call it an outright scam, but I definitely will not recommend it to anyone looking for a way to make a living, and it’s a dodgy chance you would make any extra money that equal the time you would waste on this site. There are many complaints from unhappy users all over the internet that confirm my assessment that this is not legitimate. At best, if you have way too much time on your hands and love to share your opinion for almost nothing in return then it might be a hobby to try out, otherwise, I cannot recommend you get involved with Survey Say. Thank you for letting me know. I did surveys for two weeks and can’t find anyone to pay me. So disappointed. Thanks for this great review. The advice is just to away from this kind of paid survey sites. Most of them are scams. Even if they’re not, you’re still just wasting your own time. STAY AWAY FROM ALL SURVEY SITES AS THEY DO LITTLE MORE THAN SELL YOUR iNFO TO EVERY TELEMARKETER IN THE WORLD!! i HAVE NEVER BEEN ACCEPTED TO DO A SURVEY AFTER DOING ALL THEIR “QUALIFYING ” FOR EACH SURVEY. NOW MY PHONE IS LOADED WITH JUNK CALLS. WARNING STAY AWAY FROM EVEN THE SO CALLED BEST SURVEY COMPANIES. SURVEY SAY IS THE WORST OF THE LOT! !